Castle Hostel is the new hostel in Genoa from the brand “The Hostel”. The villa was built in the fifteenth century, surrounded by green in the beautiful area of Castelletto. The property offer guides and city maps for free, rent towels, bedside lamps in the rooms, Society games. Castle Hostel is very close to the city center, 10 minute walk to Piazza della Nunziata, 20 minute walk to Acquario di Genova, Porto Antico, Piazza Principe train station. Castle Hostel has dorms, double and single rooms, green area surrounding all the Villa, open common spaces and a breathtaking view. Payment upon arrival by cash or card (This property may pre-authorise your card before arrival). You can store your bags before check in time or after check out also in our other hostel in Genova, Abbey Hostel (10 minutes walk to Principe Station). So you can keep exploring the city. Breakfast not included - 3.50 EUR per person per day. Lock out from 00:00 until 08:00.
highly recommend this hostel, the best one we stayed in throughout our whole trip! Well kept and clean little hostel up the hill from downtown Genoa. The only caution is that it's quite up the hill from the main streets, so be prepared for a sweaty hike in the humid Genoa weather. Otherwise, excellent. 3.5 euro breakfast buffet is budget friendly!! The people is excellent! The facilities are equally good. The location is not that easy to find the first time you go, i recommend to add some signs. Staff were great, very enthusiastic. Good location to walk to Genoa central. Could've done with hand towels/something to dry hands with in the bathrooms. The hike to get to the hostel is worth it - lovely views and buildings around there. The staff are lovely. The hostel has a huge open kitchen and common area, with a large garden - great for meeting other guests. I would definitely stay here again. We stayed in a double bedroom with shared toilets/bathroom. Staff were very friendly. Great atmosphere. The place was clean. Only issue is the showers need some repairs as some of them don't seem to be working properly. 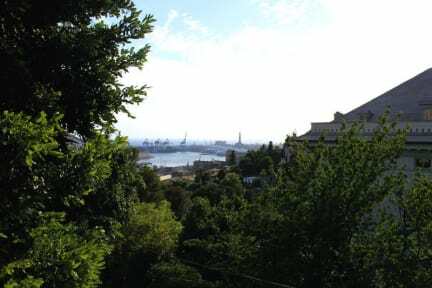 It is located on a hill high up overlooking genoa.